The United States has a largely automobile-centered approach to grocery shopping. Most Americans shop at their primary retailer using their own automobile. There are some interesting differences by income. According to data from USDA's Food Acquisition and Purchase Survey (FoodAPS), about 95% of comparatively well-off households do their primary grocery shopping in their own automobile. By contrast, for low-income households, only about 65% do this grocery shopping in their own automobile. Clearly, there are more low-income Americans than high-income Americans who lack easy access to grocery shopping. Yet, when we diagnose the problem of "food deserts" and contemplate new public policies to attract supermarkets to low-income neighborhoods, we must recognize that the local consumers are not a captive audience. Many people at all income levels have choices and mobility, and they can use their spending power to seek the prices they want at distances greater than a mile from home. In a new study in Current Developments in Nutrition, my colleagues Michele Ver Ploeg, Abigail Steiner, and I find no association between the risk of household food insecurity and having a nearest supermarket as close as 1 mile or less from home. In one sense, this result is surprising, because the "food desert" literature is heavily focused on the presence of supermarkets at very close distances to home. In another sense, this result is consistent with other recent research about the effects of introducing a new supermarket. A long time ago now, in 2011, this blog described a visit to the Hill District in Pittsburgh, where residents had long awaited a new supermarket to fill an empty lot in the middle of the neighborhood. Over the subsequent years, researchers studied changes in the neighborhood in comparison to another Pittsburgh neighborhood that did not get a new supermarket. The study found some improvements in resident food choices and perceptions in the Hill District, but many residents continued to shop elsewhere, and the changes in choices were not limited to those residents who patronized the new store. Some of the most important effects of a new supermarket may relate to the local economy and land use in low-income neighborhoods. [Note: edit Jan 30] It's not just about the food in the supermarket. NPR's Marketplace this month described a controversy over the closure of a Safeway supermarket in Greeley, Colorado. Local officials were upset that Safeway put a clause in the property sale document, preventing the new owner from opening a new supermarket. For Marketplace, Safeway's "restrictive covenant" appeared as the villain in the story. And yet I found myself sympathizing with Safeway, which has other nearby stores that would have to compete with not just a new store on the old property but also two Walmart supercenters in town, less than 5 miles away. See this Google map. It is a rough lot in life to compete against Walmart for the grocery business of a mobile car-owning public, as in Greeley. Sometimes, it is not realistic to expect the local economy to sustain more and more supermarkets. If we want to retain supermarkets in smaller lots in a downtown neighborhood, policy-makers may need to show restraint in the number of supermarkets zoned city-wide. When we seek to address food deserts in low-income neighborhoods, we don't just want supermarkets to locate in a particular place, we want them to locate where they will thrive. 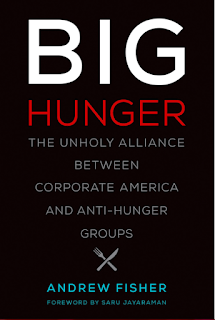 In Andy Fisher's ferocious condemnation of anti-hunger organizations -- titled Big Hunger: the Unholy Alliance between Corporate America and Anti-Hunger Groups (MIT Press, 2017) -- there is much to appreciate. 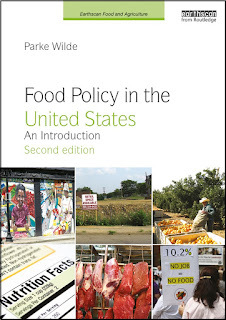 The book rightly uses a poverty-centered lens to diagnose the causes of food insecurity and hunger in the United States. It skewers a narrow type of charitable anti-hunger work that focuses only on food delivery without looking upstream at the causes of hunger. It provides a perceptive and engaging account of the relationship between national organizations, such as Feeding America and the Food Research and Action Center (FRAC), and their regional allies, such as Joel Berg of Hunger Free America. It recounts an array of silly tone-deaf hunger-themed corporate marketing campaigns, such as the Snickers Bar Hunger campaign. It offers an astute history of the cooperative but tense conversation between public health nutrition advocates and anti-hunger advocates about SNAP reforms designed to promote dietary quality. Still, I doubted the sincerity of the closing chapters' wishes to "foster increased dialogue across the movement" or to build "new alliances" between groups with diverse public interest goals. By and large, this book is a highly public wallop, bloodying the nose of the leading advocacy organizations that have for decades rallied political support for essential U.S. anti-hunger programs. This book makes lively reading, and has some good reporting, but I'll be surprised if it becomes the reading-club book for any constructive cross-sectoral dialogue.